We dive into important questions to ask and what options are available. 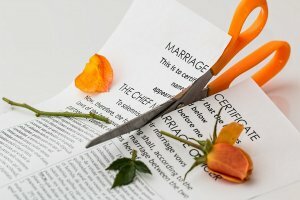 Divorce is one of the most heartbreaking experiences in life that one can ever go through. Selling a house due to divorce is also one of the biggest logistical issues people face since it is usually always the biggest asset in the family. Although some couples stay amicable after their split, many times there is animosity or resentment, making important discussions very difficult. Deciding on what to do with your house during the process can add even more stress to the already-difficult situation. Can either one of us afford the house on our own? If we both can afford it, who keeps it? If we sell, how much would we net, and what are the tax implications? Do we have time to list the property or do we want a quick sale? If you or your ex partner want to keep the house, then you can purchase each other’s share. The one who keeps the home takes out a new mortgage or home equity line in order to extract equity. If you’re the one who’s keeping the house, you have to be sure that you are financially capable to pay and maintain the house on your own or else you’ll be facing more problems down the line. The attorneys can help you determine what loan amount would be needed, what amount the other person would receive, and refer you to a good loan officer. The person not keeping the house would come off of title once the new loan is closed. Keep in mind: California is a Community Property state. That means if spouses purchased a property together during marriage, they have equal shares of ownership, thus the profits from a sale are divided equally. This is the easier scenario. But what if the house was purchased before marriage? When one spouse buys a property before marriage, it is generally that spouse’s sole and separate property. The situation becomes complicated when the spouse who is not on title helps pay the mortgage, contributes to improvements to the home, and lives there long enough. In this case, the presumption that only one spouse owned the house can be overturned with strong evidence that the spouses had an agreement they both owned it. Attorneys will be helpful in this situation. Believe it or not, many divorced couples want to keep their family house for sentimental reasons, or if there are minor children. One downside is that if the remaining party falls behind the mortgage payments, both credit reports will be affected equally. The person who moved out carries a burden that the remaining spouse will continue to make payments. If co-owning the house, communication will need to be open and cooperative. In most cases, it may be financially difficult for either party to maintain the house on their own. This is why for the majority of people, selling a house from divorce and dividing the proceeds is the best option. Once the court has approved a sale, the spouses must decide on whether to list the property or sell the house for cash to an investor and finalize the process. Selling your house to an investor is the best option for you in situations like this. Investors buy houses fast in cash, regardless of its condition. They can also close the property in as quickly as seven days, so you and your ex partner can divide the proceeds right away. If the court required a deferred sale, or both parties are just ready to get the process over with, finding an investor to buy the house quickly might be a good option. The last option would be to hire a real estate agent. However, with the commission and closing costs, the traditional selling route may not be the best option at this point in your life. Furthermore, with all the stresses and difficulties that you’ve been through with your divorce, the last thing that you probably want to do is to prepare your house for a sale, entertain potential buyers, and wait even longer for the buyer’s loan to close. As we discussed in previous articles, it is good to weigh the differences between selling to an investor or listing with an agent. If you and your ex-spouse have decided to sell your home because of divorce, call us at 877-210-6460 or fill out the form below. Skye Homes can offer you a fair, no-obligation estimate for your property. We buy houses all around the Bay Area regardless of condition, which means you don’t have to spend a dollar on repairs. Read more about how Skye Homes helps homeowners through this process.